We eat a lot of polenta in our house. There is always a container of individually frozen squares in our freezer and more often than not, I pull them out and broil them while they are still frozen. It’s easier than trying to saute or grill them which, for me, sometimes ends up a sticky mess. I prefer black beans to others so when I cook them I make an entire bag. Usually I use them to make Black Bean Soup and then strain them for making vegetarian burgers. 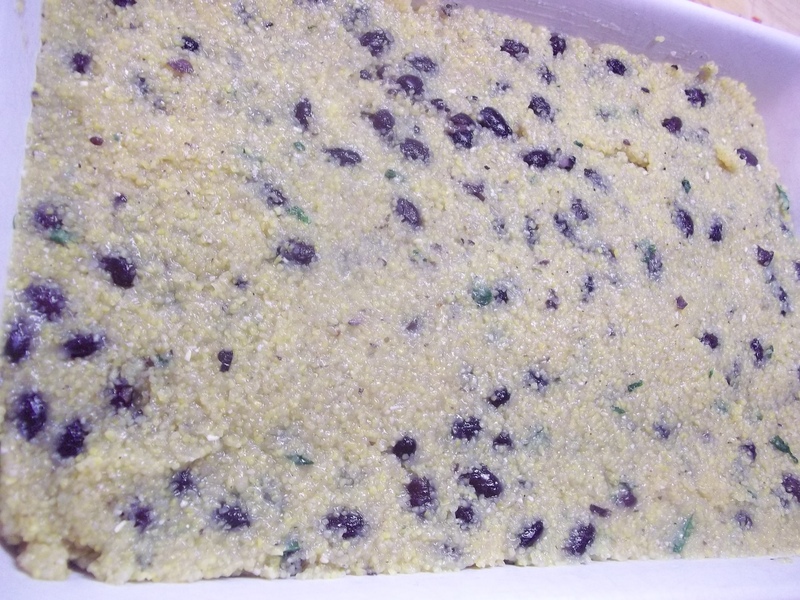 This last batch left me with enough for Mango Black Bean Salsa and these polenta squares with even more in the freezer for those nights when I need to pull something out in a hurry. Having a slow cooker as one of my newest kitchen gadgets makes cooking them a no-brainer. Time is of the essence these days while I finish up gardening, continue prepping for our homeschool year, and work on projects outside trying to get things squared away before the cold weather hits. Fast, easy meals have been key which is how this idea developed. 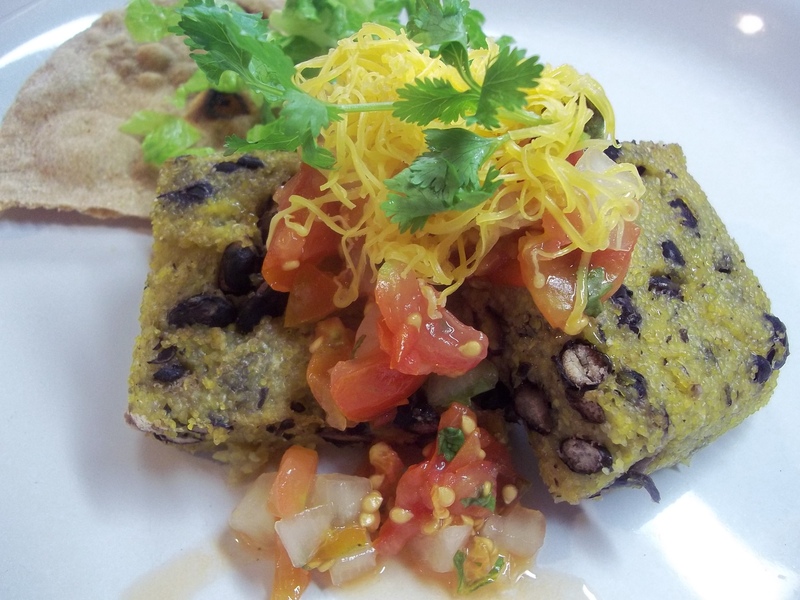 It was a quick vegetarian meal at the end of a busy Monday inspired by several recipes I had seen for black bean polenta cakes. 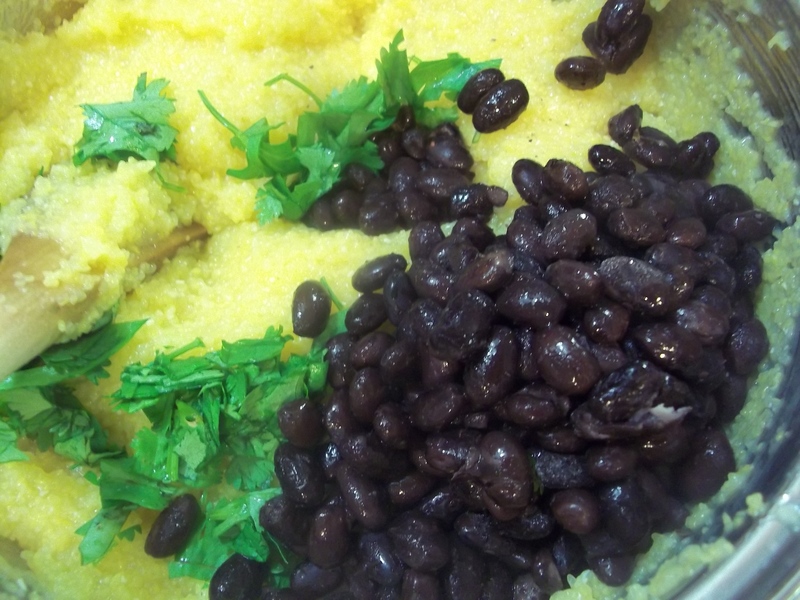 I just used my basic polenta recipe, omitted the cheese, and added black beans and Tex-Mex flavors with cumin and cilantro. Easy as making grits in the morning if the beans are pre-cooked. Pour water into a medium sauce pan. Add salt, pepper, and cumin. Bring to a boil. Stir in polenta and reduce heat to a simmer. Cover and cook until thickened, stirring often for 5 to 7 minutes. Remove from heat. Be careful when the lid is off. If the heat is too high the polenta will pop and splatter. Mix in the beans and cilantro. Spread into a small baking pan and chill. When it’s firm cut it into squares. Saute, grill, or broil the squares until crispy on the outside and warm and soft on the inside. Note: The amount of beans in the dish was not enough to make a complete protein when combined with the corn for a vegetarian meal so I served them with Whole Wheat Tortillas and a little grated cheddar on top. Salsa was a must. My family said it tasted like bean burritos in corn tortillas so I guess that means my Tex-Mex meatless meal was a success. That is a great looking veggie meal.